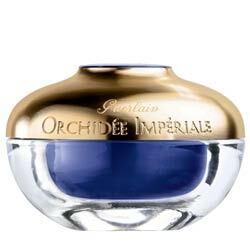 Orchidee Imperiale Neck And Decollete Cream Review: Is It Effective? Orchidee Imperiale Neck & Decollete Cream Review: Does It Work? Orchidee Imperiale Neck & Decollete Cream claims to be an innovative product to smooth wrinkles and provide noticeably fresher looking skin. It contains a secret “Gold Orchid Technology” and ingredients that firm the skin within weeks of use. The texture is described to be velvety and easy to blend and absorb on the face, neck, and chest. The cream is manufactured by Guerlain International; however the company site does not list pricing information about the product. The most recent price posted online by a major retailer is $294 for a 75 milliliter jar. The company doesn’t provide a customer service page about their return policy, any possible promo codes, or discounts either. Orchid Molecular Extract: Firms skin with a light fragrance and boosts overall radiance. Dip the neck cream with the finger tips and place the hands at the base of the neck. Apply light pressure with the tips of the finger. Then, place the hands against the chest and draw them outwards with the neck cream. Repeat each step five times. The product is easy to use, and is acclaimed to show results in as little as four weeks of use. The neck cream features a pleasant fragrance of orchid and musk that some customers may enjoy. There are no active customer support pages on the company’s website if the product does not perform as promised. The product is very expensive for the volume sold as a neck cream. Orchidee Imperiale Neck & Decollete Cream is manufactured by a company that attracts to luxury skincare customers who value pretty packaging, beautiful fragrance, and brand loyalty. However, Guerlain doesn’t show exactly what goes into the neck cream and if there are any complaints from women testers they had in their clinical study. The product seems like more of a rare purchase to use every day as part of a skincare regimen, but could be a gift that could be given to a loved one who would like its features.